By Joe Scalzo | February 8, 2011 at 12:10a.m. 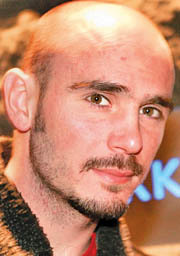 This could be a big week for Kelly Pavlik’s career. Top Rank Boxing matchmaker Bruce Trampler will be in town either today or Wednesday to discuss a possible Pavlik bout on May 7 on the undercard of the Manny Pacquiao-Shane Mosley bout in Las Vegas. Top Rank is holding a spot open for Pavlik on that night’s card, but Pavlik still isn’t sure which weight class he will choose. Super middleweight (168 pounds) is the most likely option right now, but he could also opt for light heavyweight. Pavlik has not fought since losing his middleweight titles last April. He was supposed to fight Brian Vera on the undercard of Pacquiao’s Nov. 13 bout with Antonio Margarito but pulled out of the bout in late October with a chest injury. Loew said he has not talked about possible opponents for the proposed May date, but said it’s unlikely Pavlik will fight one of the sport’s biggest names. In the meantime, Loew is preparing another of his fighters, St. Louis native Dannie Williams, for his upcoming bout on the Feb. 19 “Winter Storm” show at the Byzantine Center. Williams (15-1, 13 KOs) will meet Harrison Cuello (20-14, 15 KOs) in a welterweight co-feature. Although Cuello has a mediocre record, Loew said he’s fought some tough boxers. “He’s a guy who will let you know if you can go to the next level,” Loew said of Cuello. “He’s a very muscular, very powerful guy. Campbell High graduate Jake Giuriceo (9-0-1, 2 KOs) will meet Angel Hernandez (14-8, 11 KOs) in the main event of the Feb. 19 show. Tickets for that show may be purchased at Buena Vista Cafe in Warren, the Byzantine Center, Check-N-Go in Youngstown, Patsy’s Bar in Campbell, Up a Creek Tavern in Warren, Southside Boxing Club in Youngstown, Bedford Trails in Coistville and Wine Cellar in Youngstown. September 15, 2010 12:10 a.m.
March 3, 2011 12:09 a.m.
September 10, 2010 12:06 a.m.
September 20, 2010 12:10 a.m.